Holy. Smokes. I didn't even say where I was thursday night. This has absolutely nothing to do with knitting. But here is some insight into my little life. I was at GM Place watching and hearing my all-time favorite singer/songwriter siren do her thang. I have been a huge fan of Fiona Apple ever since her second album When The Pawn.... She blew me away. How that much talent can be packed into one tiny frame, I don't know. I also don't expect anyone to agree with me as to how great she is. Most people just don't know! How that is even possible, I don't know. Also, she was opening for Coldplay. And I am probably one of the very few people that would say that it should have been the other way around. Don't get me wrong, I like Coldplay, but I worship Fiona Apple. Is this going to be like hair cuts and colors? A new blog look whenever I feel like it? Okay, so it's not that much of a change. I've been thinking for a while that my old green and white polka dots were getting kind of washed out. This is just the darker version. Wish I had the time to design my own. Not that I know how. But if I did, I probably wouldn't have time to. No, I change my mind, I would MAKE time. Finished the first sock of two pairs today! Who would've thunk it? 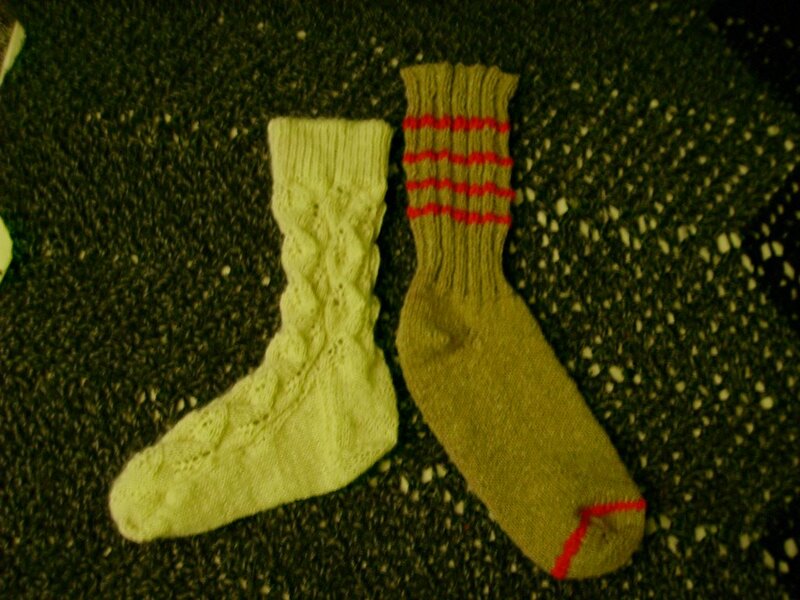 One is the Alpaca Embossed Leaves sock, and the other is recycled yarn socks for the boyfriend. The recycled yarn sock has been a backburner project for ages now! But since I've been on a little sock kick I've pulled them out. The boyfriend is pretty keen on them. 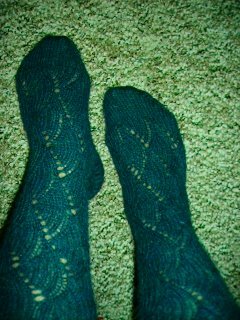 I am pleased as punch with how fast the Embossed Leaves socks are knitting! So fast. How did this happen? 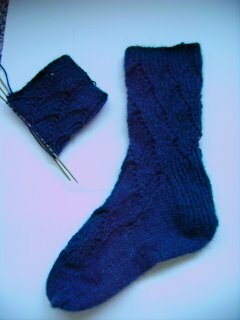 How come I like knitting socks more now than ever before? Doesn't matter. What's done is done. Pomatomus is done! I am gifting them tomorrow. The socks fit a little loose. She was right when she said the pattern makes for very stretchy socks. C'est la vie. I am surprised at how fast they knitted up and that I didn't get second sock syndrome. Do you know what is even more surprising? 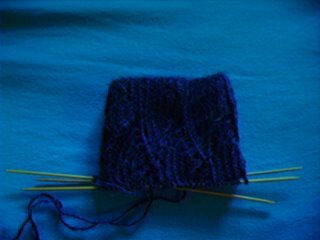 I went and started another pair of socks. In white Drops Alpaca. Why more alpaca? 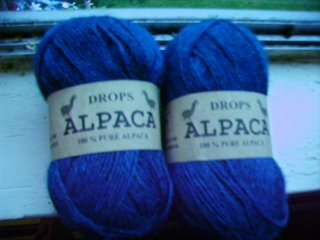 Because I like knitting with alpaca. And I already know who they will be going to. My mom's friend who was thoughtful enough to send me more old-school knitting patterns. This is the Embossed Leaves sock pattern from the Winter 2005 Interweave Knits. I am addicted to this yarn. Addicted. Must. Buy. More. Yay! One sock done, one sock to go! I'm feeling really good about these socks. And I know who they are going to now. A co-worker that also knits alpaca socks! It's perfect. I can't wait to finish them now. I find that with this pattern, there is no muss or fuss and it knits pretty fast. Right now I am alternating between burning through these and reading White Oleander. Even though I should be knitting other pre-Pomatomus promised things. Sometimes one project will take a hold of you and you just can't stop. The up side is that they will be quick! 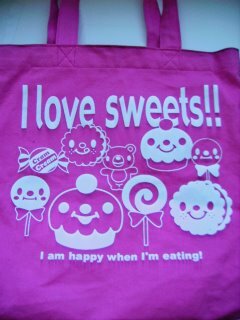 Also, I thought I would show the new bag I bought while I was in Calgary. It speaks the complete truth about me. I am using to tote around small projects. (mitts, socks and the like.) Too bad there isn't one that also says " I am happy when I'm knitting. Last week I also pulled out my lovely brown alpaca fleece that I purchased in Montville, QLD and gave it a try on the drop spindle. It went okay but I am seriously pining for a decent spindle. I can't stand the homemade ones I have and I won't even show you what they look like. I only want a drop spindle from Golding like the one that Caitlyn at Knot Without My knitting got for X-mas. But for now I am dutifully saving my money *sigh* so it will have to wait! The beginning of Pomatomus. I am liking the pattern so far. I am still slightly skeptical of socks in general but I am far from writing them off. So here I am, vernturing back into heel flaps and toe decreases. I hope this works out. 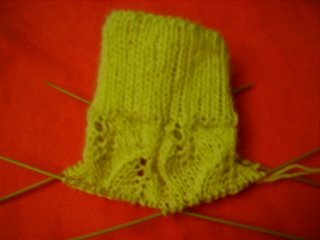 I am also eyeing the leaf pattern socks in the Winter 2005 Interweave Knits, maybe in white alpaca? I don't know who will wear these socks. Not me. I don't like wearing socks in general, and when I do, I abuse them. I have made one wearable pair of socks to date, and I don't wear them for fear that horrible holes will appear and destroy all that I've worked for. No sir. They can live in my sock drawer for all eternity. Nicely folded and only worn once to take pictures. I'll probably gift these socks away. There, I feel better now. Someone else can wear and love these socks. Cursing me for using alpaca for socks. Because who uses alpaca for an article of clothing that gets worn and washed over and over again? Crazy people that don't intend to wear said socks. Ha ha ha. * This is my current scarf on the needles. 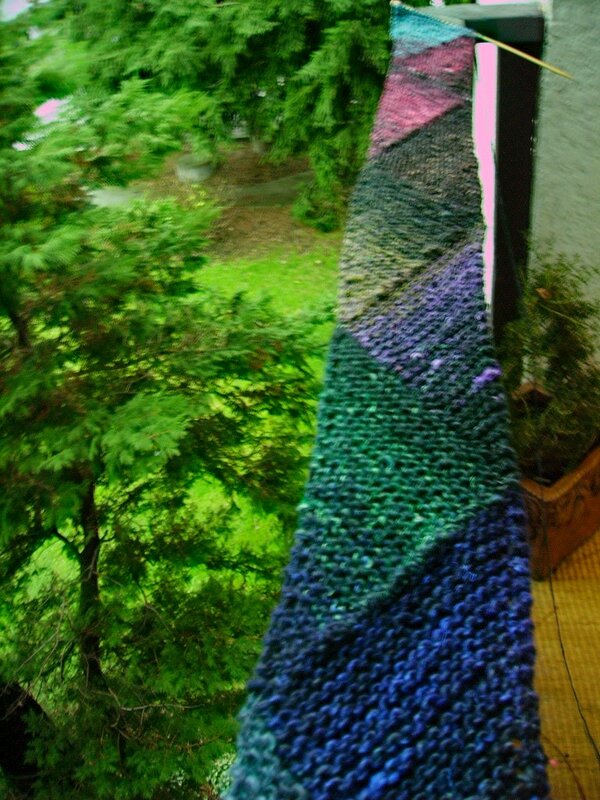 Zig Zag Scarf using Noro Silk Garden, I think the feel and weight of this yarn is perfect for this pattern. I like how fast this pattern knits up too. I was in Calgary over the holidays, visiting my family etc etc and my mom and I made time to hit a couple of yarn stores. (Of course!) The ZigZag Scarf is part of her X-Mas gift, and she picked out the yarn herself. She also picked out a nice dark grey in the Elsebeth Lavold Silky Tweed so I can make a pair of gloves for her too. I don't know why but I still have trouble getting fantastic shots of new yarn that I purchase. I have two new balls of Butterfly mercerized cotton (my first Grecian yarn) and also this! More Drops Alpaca. I have this yarn in white and green. When I saw this beaut of a color I couldn't resist. Even though I am still unsure as to whether I adore socks like most knitters do, I found a pattern at Knitty.com That I think might look pretty killer. I am addicted to those gloves I've been knitting. My favorite thing to be knitting right now. I still have to finish a pair for Jennn, (I'll try to update more often Jennn!) then my mom's and one for an old co-worker of mine. 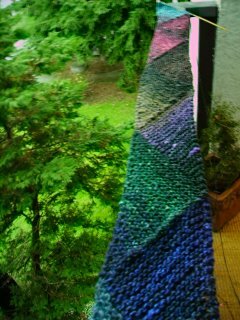 Another project I have in mind is a shawl for one of my mom's good friends. 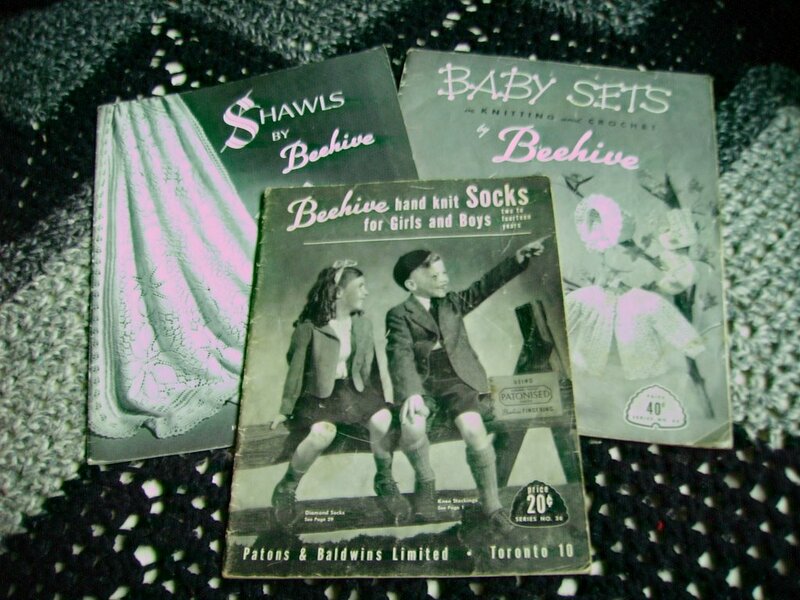 She was kind enough to dig up some old-school pattern books from Beehive, and there is a rose leaf shawl pattern with her name on it. Oh! And I almost forgot, my lovely co-worker Cindy gave me some great, fun green yarn that is somewhat reminiscent of Oscar the Grouch. I have no idea of what I will do with it but I have 5 balls at 89yrd. Doesn't seem like anything too exciting for me right now. Just sort of ho-hum things. Maybe it's just the time of year. I will strive to be more energetic in my next post. *For erleca's comment: I took that picture Jan. 4th, 2006. I live in Vancouver, BC where it is nice and mild in the winter. Some of the vegetation stays green year-round.